Long before Harlem was set as an inspirational place of Jazz, Cab Calleway and Ella Fitzgerald, Harlem was a perfect and strategic location for many Dutch settlers in 1658. The town was named after a city in Holland called Nieuw Harlem. It was the British immigrants that condensed the name to Harlem. Early on, the rich soil and easy access to water made Harlem an agricultural mecca. As with most small towns across America, once the railroad came things changed and Harlem became industrialized. 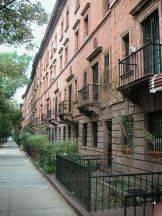 It is recorded that in the year 1910 there were 500,000 residents in Harlem. African Americans were strong in Harlem and by 1930 their numbers grew. During the 1950's and 1960's Harlem was considered important to the political and economic heartbeat for the African Americans. Harlem was noted for heated political and social uprisings, including the 1968 riot following Dr. Martin Luther King, Jr.´s assassination. With Broadway and 158th Street to the West and through its diversity, Harlem started re-inventing itself with Entrepreneurs opening unusual shops, older buildings were renovated and investors were interested. By the late 1990's Harlem has returned to its prideful self. The East Harlem community is considered from First Avenue to Fifth Avenue and from East 96th Street to East 125th Street. Central Harlem is from Central Park North to the Harlem River and from Fifth Avenue to St. Nicholas Avenue. West Harlem, stretches from 123rd to 155th Streets and from St. Nicholas Avenue to the Hudson River. 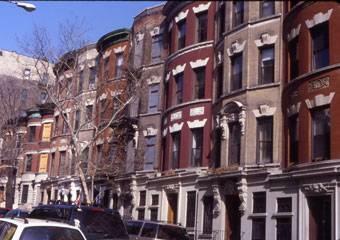 Harlem Strivers Row or King Model Row Houses as they were called in the 1920's and 1930's. Striver Row is a group of Town homes in West Harlem. Audubon Terrace >Hamilton Heights/Sugar Hill (West Harlem) Hamilton Heights/Sugar Hill is a neighborhood of paramount culture as well as architectural and historical significance.